We have English thyme and lemon thyme, both of which grow prolifically in our garden. I’ve become rather fond of the flavor lemon thyme adds to poultry, fish, and even desserts such as this refreshing lemon thyme sorbet. Last month I sampled some lemon thyme butter cookies that knocked my socks off, and I’ve held off making them for fear that I might eat them all myself. I must find an occasion to make them and give them away so I can justify tasting just one again. Somehow, I managed to get the boys hooked on lemon sorbet. They’ve always liked tart citrus flavors, even going so far as to nosh on lime slices, but their level of devotion caught me by surprise. They hung all over me as I photographed this and shared it with delight. 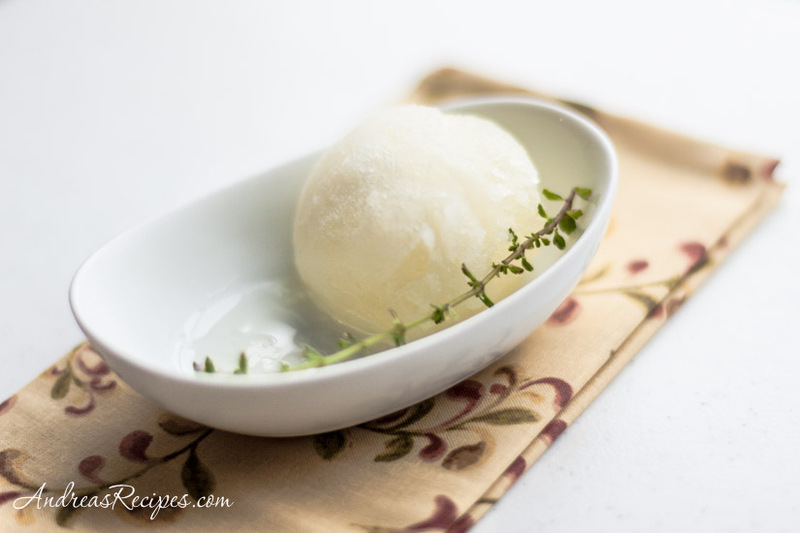 This lemon thyme sorbet is my contribution to Grow Your Own, a blogging event that celebrates the dishes we create from foods we’ve grown, raised, foraged, or hunted ourselves. May 30th is the deadline and The Daily Tiffin is our host for this round, so be sure to visit for more information about submitting your post. If you are new to the event, you can read more about the rules for participating at the Grow Your Own page. There are a few days left before the deadline, so you still have time to join in the fun! In the sauce pan, bring the sugar and water to a boil over medium high heat, just until the sugar dissolves. Remove from heat. Add the lemon thyme leaves and lemon zest. Allow to sit for 10 to 15 minutes, until the flavors are infused. Stir in the fresh lemon juice. Allow to cool to room temperature. Transfer to the plastic container, then cover and refrigerate overnight. Freeze according to the manufacturers directions for your ice cream freezer. The sorbet will be soft when finished. You can transfer to a freezer container and freeze for another hour or two before serving if you prefer a harder consistency. Prep time does not include overnight resting time. That looks so refreshing! I can’t wait to have a garden. Alisa – Frugal Foodies last blog post..Giveaway Alert: Brand New, All-Natural Candy Bars!! This is beautiful and looks very enticing! I’m growing lemon balm for the first time this year, but may have to try a pot of lemon thyme just to taste this recipe! Would love to make something like this from ingredients in my own backyard garden! Do you ever cook with lemon balm??? I know it only for its use as a tea, which I’m quite happy to use – but wondered if there was “more” to it than tea. Thanks Alisa, it is very refreshing! Hi Debbie. I don’t have lemon balm in my garden, though I do have lemon basil and lemon thyme. Obviously the flavors are different, but you can experiment with interchanging lemony herbs in dishes. Also try Food Blog Search and search for “lemon balm.” I found a number of recipes calling for it. What a refreshing combo! This sorbet must be delicious! I would never think of making thyme sorbet. Thank you for the link. I’m placing one to your site in my links as well. This sounds so refreshing and delicious. 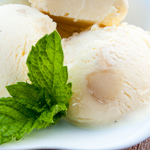 I love the idea of combining fresh herbs with desserts. this recipe is so simple and clean. 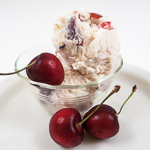 great summer taste! can’t wait to give this a shot. I never used lemon thyme until I began to grow it in my garden. I never find it in the produce section of any of the markets I go to; I wonder why not. 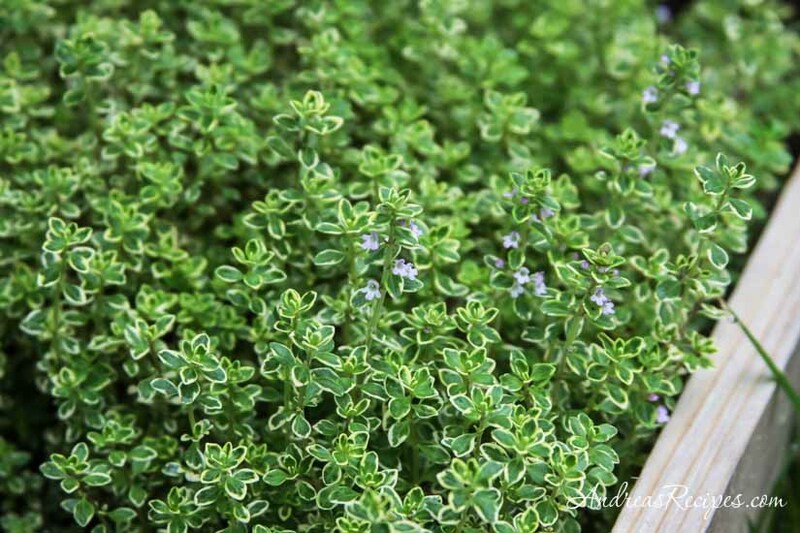 Lemon thyme is lovely, has a distinct flavor and beautiful aroma. I love it with fish. I love a “twist”. Back to the garden center for some lemon thyme. My potted herb garden just keeps getting bigger! Hi Lydia. I’ve never seen it for sale in stores, either. I guess they feel lemon thyme is not mainstream enough to carry it. It’s easy to grow in pots or the ground, though, and definitely worth planting. Hi Erica. In our area thyme stays green year round, so I don’t have to dry it, but it’s easy to do. Just cut as many stalks as you want, tie a string around the cut end, and hang the bundle upside down until dry. Then strip off the leaves and store in a tin or jar. I’ve been wondering how to use my thyme. Thanks! Do you dry your thyme as well? I’m trying to figure out a technique for drying and storing my thyme for my spice cabinet. This looks just gorgeous! I’m going to have to try this one. Many thanks for the inspiration! YuM! How exciting that it is that time of year again! 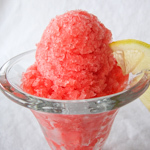 yummi..how interesting, sorbet looking delicious and so perfect! i’ll try it. thanks for sherng ya. Will you post your recipe for the lemon thyme butter cookies on here? I am looking for lemon thyme recipes and they can be hard to find! Thanks! Hi Susan. I do have this recipe and will write about it soon.